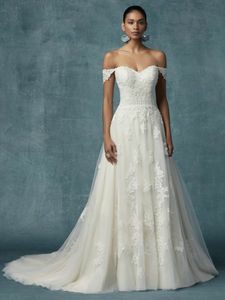 Description: Boho lace motifs drift from bodice to skirt in this tulle A-line wedding gown, completing the strapless sweetheart neckline. Delicate beading accent the waist. Finished with corset closure or zipper over inner corset closure. Sheer cap-sleeves accented in lace motifs sold separately.